Would you describe your workplace as Happy? From the moment you begin each work day, you contribute to its culture. With your behavior, communications and attitude, you can impact your overall happiness and that of your co-workers in the workplace. Taking a few simple and creative actions can all build up to happy workplace culture. How? This book offers a 100 ways to choose from. 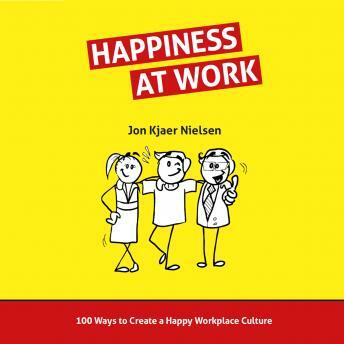 Penned by Jon Kjaer Nielsen, author, international speaker and podcast host of the HappyWays Podcast, "Happiness At Work: 100 Ways to Create a Happy Workplace Culture" is nothing short of what it claims to be: a manual on how to improve your workplace atmosphere. Whether you are a CEO looking to improve your firm's workplace culture, a team leader looking to bring your group closer together, or simply a man or woman who wants to improve your own workday, this is a book you can benefit from today. The author delivers a comprehensive collection of ideas and practical everyday tips, all of which have one clear aim -- to create more happiness in your job, office or workplace. Instead of sticking to theory and generality, Nielsen takes a hands-on approach and uses clear, relatable examples as well as fascinating research findings. "Happiness At Work: 100 Ways to Create a Happy Workplace Culture" is an invaluable tool anyone could benefit, from entry-level employees to human resources executives and up to the CEOs. Because when it comes down to the workplace, all of these people want the same thing: to be happier. Last but not least, "Happiness At Work: 100 Ways to Create a Happy Workplace Culture" is designed and written in a clear-cut and modular way. Each of the 100 chapters presents a clear activity to implement for future benefit, so there is plenty to choose from. Don't spend another moment in an unhappy workplace - grab this book and get started on creating a happy, safe and enjoyable workplace right away.